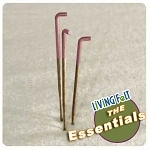 COLOR CODE: PLAIN = Felting Needles 38 gauge Spiral, Fast Work & Ultra Detailed Condensed Felting. WOW FACTOR! 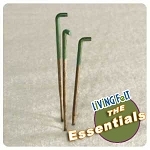 These unique Spiral Felting Needles take over where all others leave off. These allow for precision work and the tightest felting pattern. 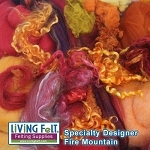 Needle twists fibers in a spiral as you poke for more rapid felting/entangling of the fibers. 38 gauge SPIRAL FELTING NEEDLES - very rapid, felt ultra dense work! 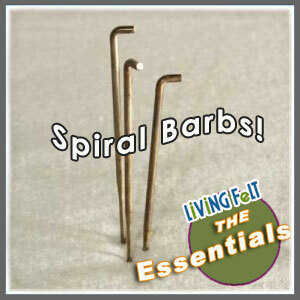 If you love your 38 Star, you are going to SUPER LOVE these 38 Spiral needles!! The spacing of the barbs along the spiral allow you to further needle felt and compact an object both "at" and "below" the surface. You may notice that obvious "crunch, crunch" when needle felting a ball and it is starting to harden, but the crunch is primarly happening at the surface due to the barb placement...with the spiral felting needles, you will feel a nice glide and the spacing/positioning of the barbs will help further felt below the surface and at the surface of the object. 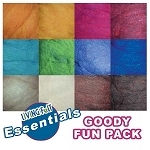 Follow up with a 40 Spiral Felting Needle or a 40 Triangle Felting Needle and Finish with a 42 Very Fine Felting Needle.